Now that we’re entering the second week of the Fall semester, we’re days away from the Friday, Sept. 15 deadline for you to have met with your Advisees, reviewed their schedules, submitted “Review Complete” for each one and archived their plans. This new “Review Complete” system was put in place this semester at the request of faculty who wanted to be able to meet with their Advisees to review their final course selections after the deadline to add courses had passed. 2. 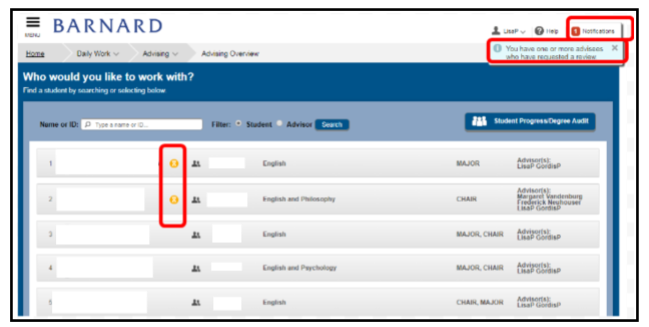 After you meet with your Advisees, and you and the Advisees agree that their semester schedule is final, you then need to do the final step in the advising process: click the “Review Complete” button as seen below. If you want to remind your Advisees how to see when you've clicked "Review Complete," visit the First-Year Student Blog. That's it - you're done!! 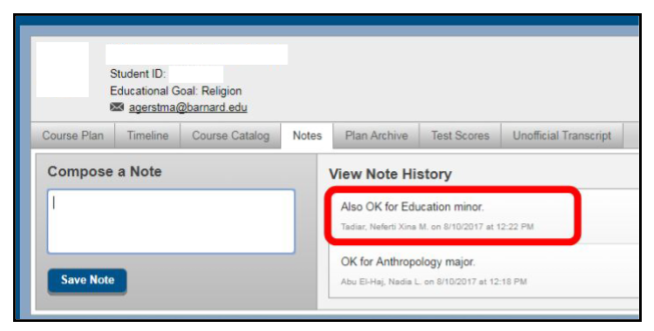 What is the "Review Complete" process for a student who has two majors, and thus, two Advisers? There is a special advising process for students who have two majors, and thus, two advisers. 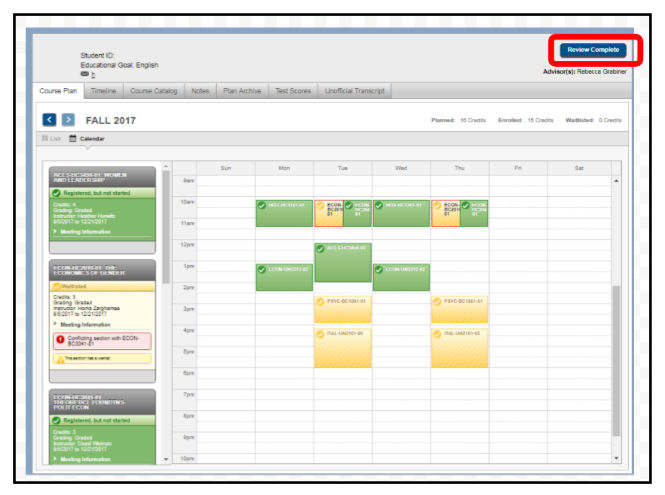 If you are the first of the two advisers to meet with the Advisee, you will NOT click “Review Complete” after meeting with the Advisee because that would remove the flag that alerts advisers that a student’s schedule needs reviewing. Instead, you as the first adviser, will select the “Notes” tab as seen below and type into the box something that indicates you and the student are satisfied with their final schedule as it pertains to your area of expertise. Then click the SAVE NOTE button (visit "How to use the Notes function" for more information on using the Notes function. Once you click save note, your okay will appear in note history with date, time, and attribution. If you are the second adviser, have seen the note from the first adviser and are meeting with the Advisee, please add your own note so the first adviser will know you have also approved the plan. Then, you will be the adviser to click “Review Complete” as described above.